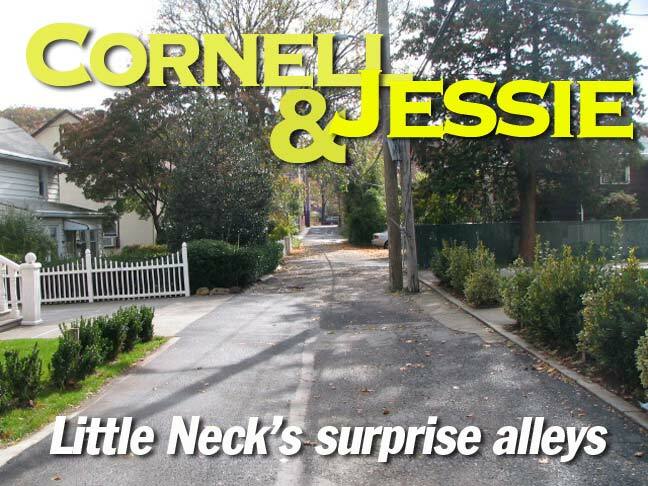 Two dead-end lanes called Cornell Lane and Jessie Court, running north from Northern Boulevard between Marathon Parkway and Little Neck Parkway, have been there for decades — likely as much as a century. Yet, I had no idea they were there until I moved to Queens in 1993 and found Cornell Lane riding past in a bus one day, and somewhat later on I was tipped off about Jessie Court, which I had always taken for a private driveway, during an interview/tour for Newsday when we wound up in an adjoining real estate office and one of the employees told me about it in halting English. 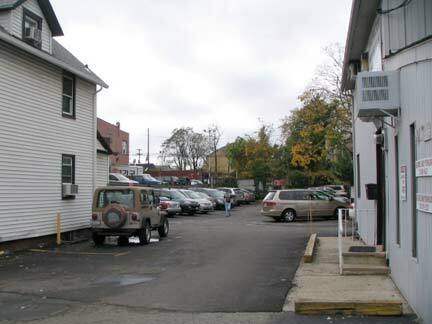 Access to Cornell Lane is through a nondescript driveway between a pair of brick buildings, with a furniture store on one side and a bar on the other. I screen-capped a portion of a 1927 Belcher Hyde map (on which I superimposed in red Cornell Lane and Jessie Court) showing that even then, buildings were in place on both cul de sacs (or is it culs de sac?) On the left is Marathon Parkway, which has gone through stints as Clinton Avenue and 250th Street, and Little Neck Parkway (Old House Landing Road) on the right. The fire company on the extreme left side, at Northern and Marathon (partly cropped off) is now…a McDonalds. 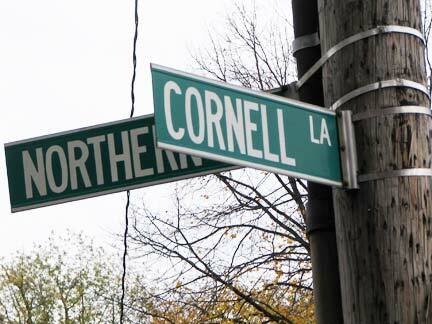 It’s unclear to me how each street was named, but going back a hundred years, one of the major landholding families in Little Neck was the Cornells. James Waters, descended from Matinecock Indian ancestors, was another, as was the Cutter family with its scion, Bloodgood Cutter. 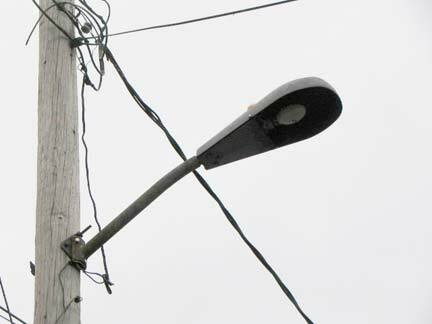 In 2008 and 2009 most streetlights in eastern Queens were replaced with brand new models, but Cornell Lane has tenaciously managed to hang on to a 40-year old Westinghouse open-air mercury luminaire. Walsh’s final stop was at a pair of little streets in Little Neck, both of them dead-ending off Northern Boulevard, both of them missing from any Queens map he’d ever consulted. Once past the buildings that flank its beginning, Cornell Lane opens ontoan area where everything seems to have been built at three-quarters scale. 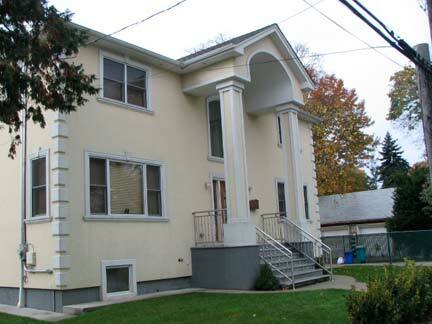 The houses, sided with stucco or vinyl or wood, are small. Fences surround some of the structures, but these are barely knee-high. The asphalt lane is so narrow that the arms holding the streetlights have been cut down lest the lights hang over front lawns and not the roadway. Inside one of the tiny houses, stripped to his undershirt, Jim Deveau performed some weekend maintenance work with an unseen power tool. As Walsh smiled and nodded at Deveau’s remarks, an older woman burst through the door and told the man to return inside because he wasn’t dressed for the weather. He listened to his mother. 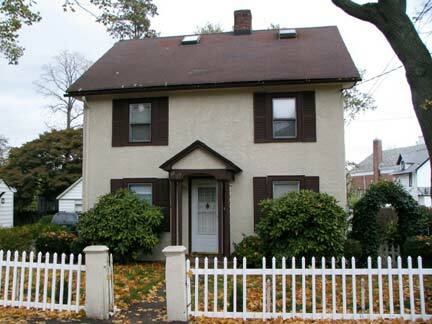 The cottage is, or was, the Deveau house. 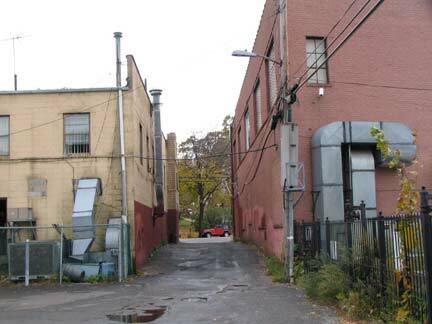 The building above left, though, is relatively new, and changes, not altogether to the better, in your webmaster’s opinion, have come to Cornell Lane. Cornell Lane has succumbed, like any other Queens street, to the forces of modernization and newer, uglier residential construction has made its mark. 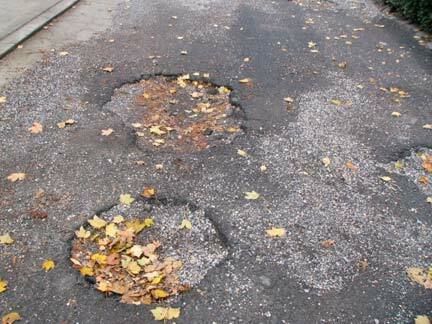 The city hasn’t fixed Cornell Lane’s many potholes — since it’s not officially on city maps, I’d think the local property owners would have to. 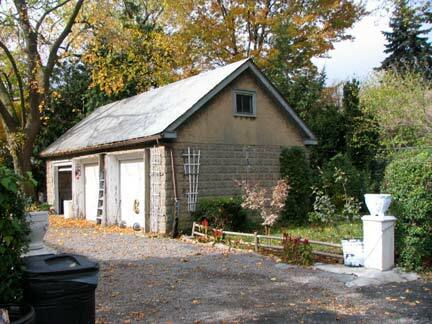 Cornell Lane skitters to an end at this double house and accompanying garage. 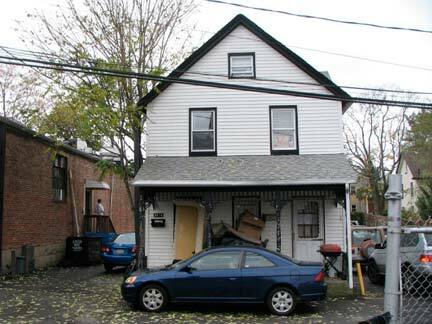 The strangest thing of all about Cornell Lane is that it contains buildings with both the old Queens numbering system, starting with #1, #2, etc. 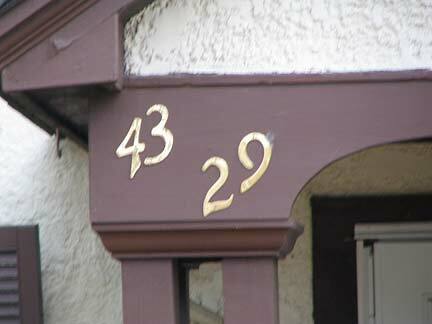 and the newer one, instituted in the 1920s when all of Queens got the same street and house numbering system. 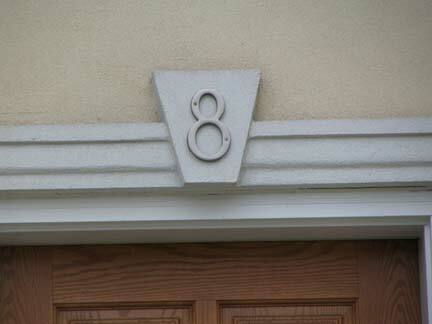 Some houses have one, some have the other. 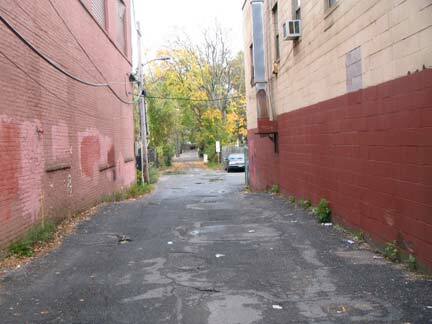 Only one other street in Queens has this condition: Walnut Street in Forest Hills. Go back to the Northern Boulevard entrance (above) — by the time you’ve come to the end, it’s hard to believe both ends belong to the same street. Back to that Newsday article…. Hellas Nicodimou of Little Neck Realty, which is on Northern Boulevard at Jessie Court, said “Jesse” was the correct spelling. As Walsh walked down the boulevard, Nicodimou came out of the office and yelled for him, signaling by waving a big Hagstrom’s map book over her head. Once back in the office, she said she’d been mistaken about the spelling and pointed to a page in the book’s index, where Jessie Court was duly listed. Then she flipped the pages until she reached the maps section. “No?” said Nicodimou, still flipping. 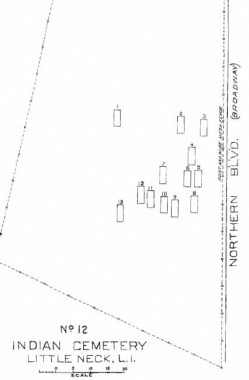 After the woman found the appropriate map, Walsh tapped at the section of Northern Boulevard and Marathon Parkway where an angular and anonymous piece of land was shown where Cornell Lane and Jessie Court should have been illustrated. 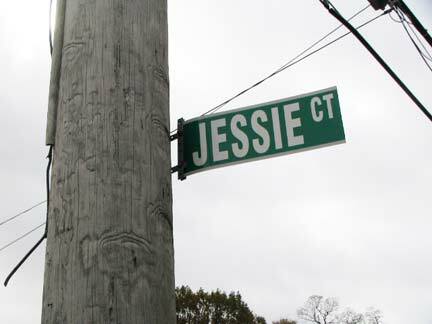 Jessie Court had not been marked for years before this sign appeared on Northern Boulevard in 2009. Perhaps Little Neck Realty put it there, since it’s a nonstandard street sign. 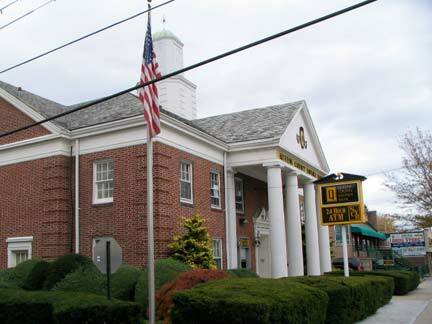 Right by the entrance is this formidable, brick-columned Queens County Savings Bank, with its ever-present black and gold signage. 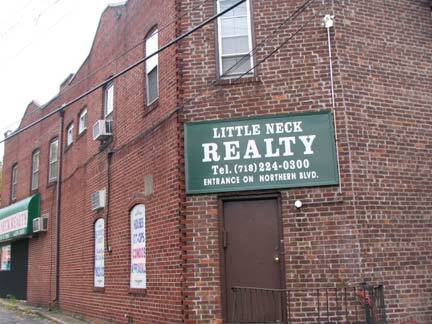 Little Neck Realty is located in a brick building on the west side of Jessie Court at Northern Boulevard. 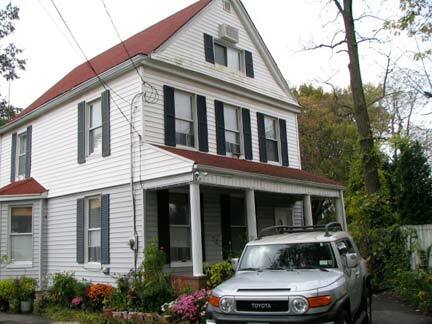 Behind it is a wood frame house of considerable years. But the realty has a secret of its own. 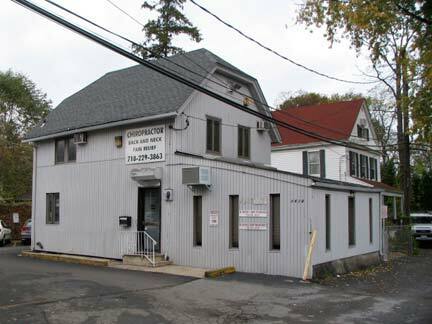 The real estate office lies on an ancient Matinecock Indian burial ground. For much of the 1800s the property adjoining the grounds was in the Waters family of Matinecock lineage. 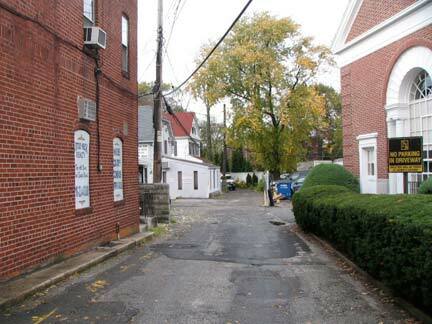 When the road was widened in the 1930s, the remains were disinterred and moved to the Zion Church yard further west on Northern Boulevard near Douglaston Parkway. Both these maps, produced about 1919, were taken from a Queens Topographical Bureau survey of private cemeteries in Queens. 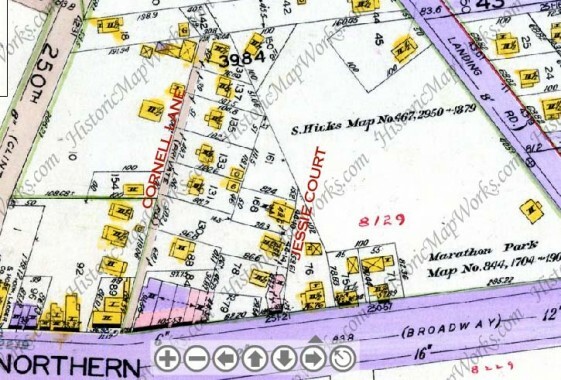 By then, as you can see, both Cornell Lane and Jessie Court were mapped; in addition, the likely proper spelling is Jesse, after all. In 1656, Thomas Hicks — of the Hicks family that eventually founded Hicksville — forcibly drove out the “last of the Matinecock” in the Battle of Madnan’s Neck at today’s Northern Boulevard and Marathon Parkway. 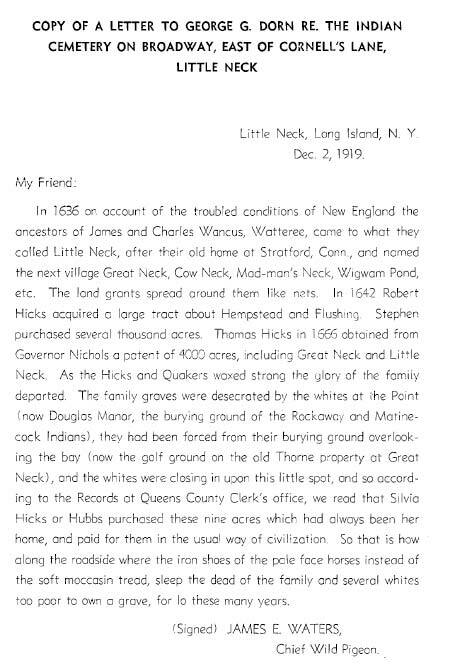 This extraordinary letter written by James Waters, who at one time owned the surrounding property on Northern Boulevard, laments the end of Native Americans in Little Neck. Jessie Court residences. 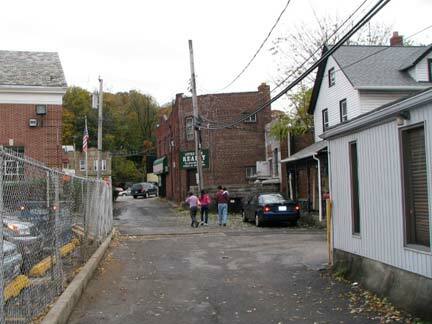 The building on the left is reputed to be the original Little Neck station house on the nearby Little Neck Long Island Rail Road station. The LIRR arrived in Little Neck in 1866. Looking toward Northern Boulevard. 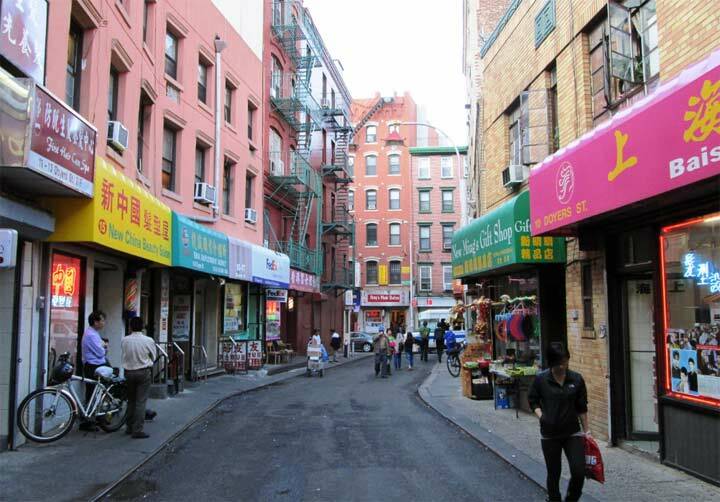 If anything Jessie Court has busier traffic than Cornell Lane — it accesses a parking lot serving Northern Blvd. restaurants and businesses. 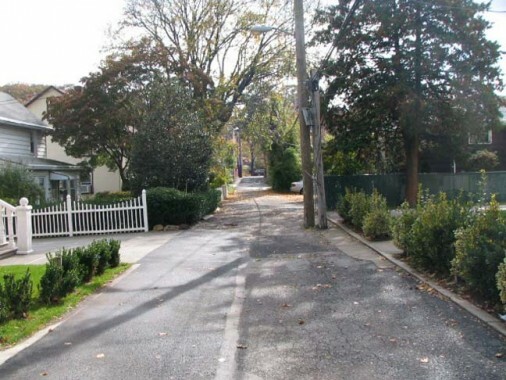 At the end of Jesse court, through the woods lives the Baron family (decedents of the Waters family) on the left and the Water’s family on the right (along Little Neck Parkway). They still live their today. 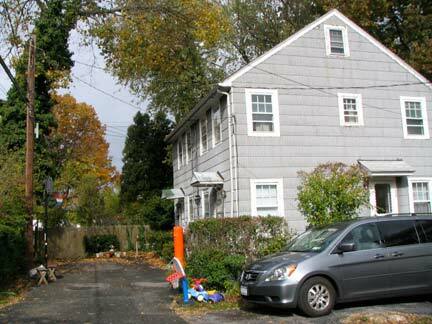 The garages at the end on Cornell lane do NOT belong to the 2 family on the right but to the home in front of the garages (if it is still there). 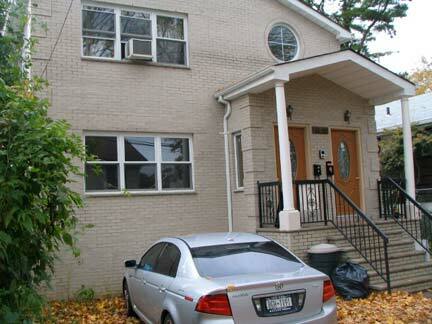 I lived in the apartment above the bar at the head of Cornell lane from 1939 until 1956. Across from the bar (where you said is not a furniture store) my dad and uncle owned the Pool Room/Bowling Alley – upstairs. Across Northern Blvd from the bar – Santa Claus always headed up the annual Christmas party and gave presents to all the kids. 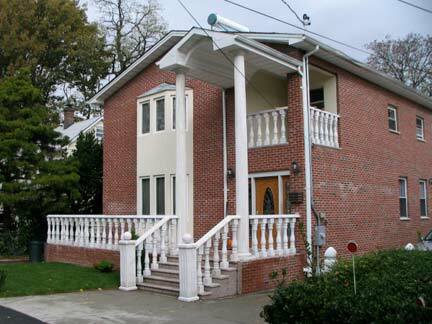 I spent many an evening in the Pool Room on Northern Blvd. This was in the 1960’s. I learned to play pool there..